This is a 2-4 day lesson that covers applying the Pythagorean Theorem. This is a sample lesson from my 8th Grade Geometry Unit. 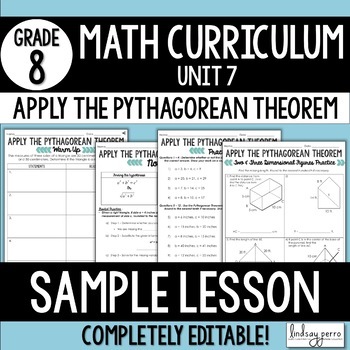 This lesson and the entire 8th Grade Geometry Unit is part of my 8th Grade Math Curriculum. If you'd like to purchase the bundle, please click here! Activities are not included in this resource. My 8th Grade Curriculum is offered as an add on to my 8th Grade Math Curriculum Resources Mega Bundle and all activities in my store.